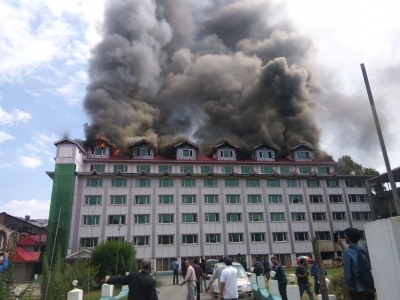 Srinagar Sep 15 (IANS) A massive fire broke out at a hotel here on Saturday with fire tenders trying to contain it from spreading. The blaze started at the top floor of the multi-storeyed Pamposh Hotel on Residency Road. The building houses offices of some news channels and business establishments. There were no immediate reports of casualties and the cause of the fire remains unknown.